Lake Texoma water temp is 64-70 degrees and lake elevation is 614.48 feet above sea level. The first part of April, Lake Texoma striper fishing has seen steady improvement. We're still using live bait drift fishing the 15-25 ft depth. 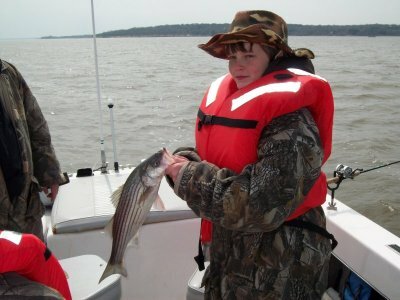 The size of the fish has improved from the smaller males to the 16-19" good keepers and your over 20" stripers as well. Just about everywhere I've fished I am finding alot of stripers holding on the flats in 20 ft and less water.